As the Dutch Golden Age reaches its climax one of Still Life masters started a very ornamented, rich, almost ostentatious depictions of the Dutch wealthy. 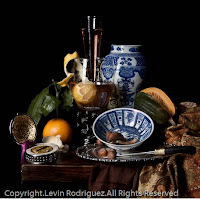 Richly decorated golden goblets, magnificent Chinese porcelain bowls, jars, dishes, highly decorated chalices or tazzas, oriental rugs, wine jugs, etc were neatly arranged with grapes, oranges and other exotic fruits. 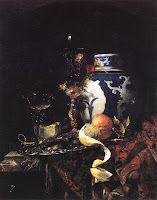 These paintings are known as “pronkstilleven”or “ostentatious still life” and they were the brainchild of Willem Kalf . Others like Peter de Ring, Abraham van Beyeren and Davidz de Heem followed his lead and took it to new heights. Kalf’s pronks seem to challenge the beauty of the original objects, according to Norman Bryson in Looking the Overlooked; Four Essays on Still Life Paintings, it seems like if he wanted to establish painting as a superior form of art above all others. 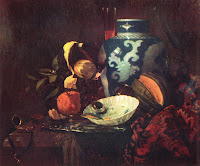 If he could paint these objects in a way that would look better than the original, that meant that painting could outdo all other forms of decorative arts. According to Bryson, Goethe (the man regarded as the pinnacle of German literature) wrote about one of Kalf’s paintings; ”One must see the picture in order to understand in what sense art is superior to nature and what the spirit of man imparts to objects. For me, at least there is no question that should I have the choice of the golden vessels or the picture, I would choose the picture”. See below some of Kalf paintings and my photographic rendering of them. 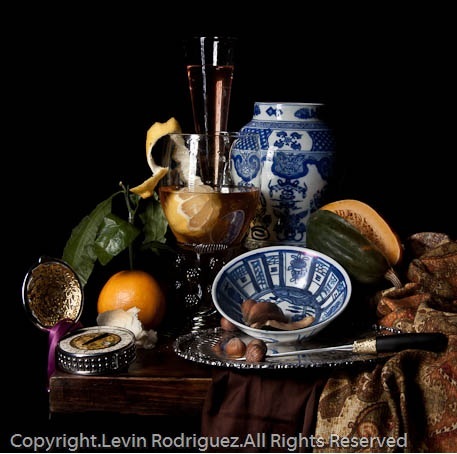 You can read more articles about this topic by clicking on Dutch Golden Age Still Life label at right panel. Fascinating - especially how it shows the difference between very sophisticated photographic and painted rendering.